The displayed fares were last found on: Wed | 17 April 01:22 AM(EST) . Fares are round trip. The Roatan, Honduras flight deals shown above are for round-trip flights from some key US cities. However, the fares are based on historical data and are subject to change. To know the current fares of flight tickets to Roatan, perform a new flight search using the flight booking engine provided on the top. Cheapfaremart is the leading fare comparison and booking site recognized by the American Society of Travel Agents (ASTA). Compare one way and round trip flights to Roatan and confirm flight booking at the best price. We help you book your flight ticket with over 200 popular airlines.You can customize your flight search with filter options – nonstop, one-stop or two-stop for better comparison. It’s important you pay attention to the stopover time while booking your flight tickets. What is the Best Time to Visit Roatán, Honduras? Winter (November to February) is the best time to visit Roatan, Honduras. The average temperature floats around the lows of 80s℉ (Fahrenheit). During this period, the average temperature in San Francisco stays in the highs of 40s℉. 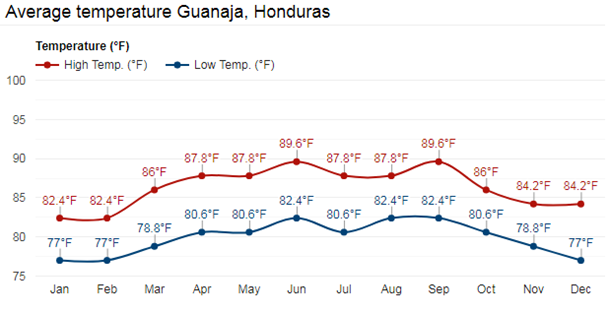 Temperature comparison over the year, reveals the summer of San Francisco or Las Vegas is the winter of Roatan. So, if you have been looking for a vacation to a warmer place to escape the winter season, Roatán could be an ideal choice. What Things to Do in Roatan Honduras? West Bay Roatan is the biggest bay island in Honduras. Don’t confuse West Bay with West End, the latter is a paved road-lined featuring shops and small hotels, while the former is a larger area consisting of West Bay Beach. Boarding the particular boat, Coral Reef Explorer is the aspiration of every visitor. This will help you to explore the reef systems of the Bay Islands thoroughly. This 11.5-acre oasis is part of the Bay Island and is home to some of the classic ruins of Maya Key. The greenery and the architectural legacy leaves visitors in awe. Enjoy snorkeling, surfing, and paddling, and stand-up paddle boarding in crystal clear water, soak up the sun by an expansive, resort-style pool, and feed a friendly Capuchin monkey at a rescue center. So, live out your dream. For an adrenaline rushing experience, visit South Shore Canopy Zipline and take a tour. There are eight suspension bridges spread across 28 acres of lush Rotan Island. The maximum cable length is 1300 ft. with the highest point being over 100 ft. The duration of the tour is between 60 and 90 minutes. The tour is 3 kilometers long or about 2 miles long. Juan Manuel Gálvez International Airport (RTB) is the primary airport serving the city. Connecting flights are available from most of the US and non-US cities to Roatan, Honduras. The common stopover airports are San Salvador (SAL) and Houston (IAH). Alternatively, you may choose Golosón International Airport (LCE) as your arrival airport. How Much Does a Flight to Roatan Cost? On the top of the page we have displayed some best Roatan airfare deals. However, the fares in the aviation industry are dynamic. The price of plane tickets to Roatan is subject to change and non-warranted. Check current cheap air tickets to Roatan with our flight booking engine. Why Book Airline Tickets to Roatan with Cheapfaremart? Search, compare and book your cheap air tickets to Roatan. For help regarding finding the best flight routes and reserve your flight, call us on 1-844-869-5222 (Toll-Free).